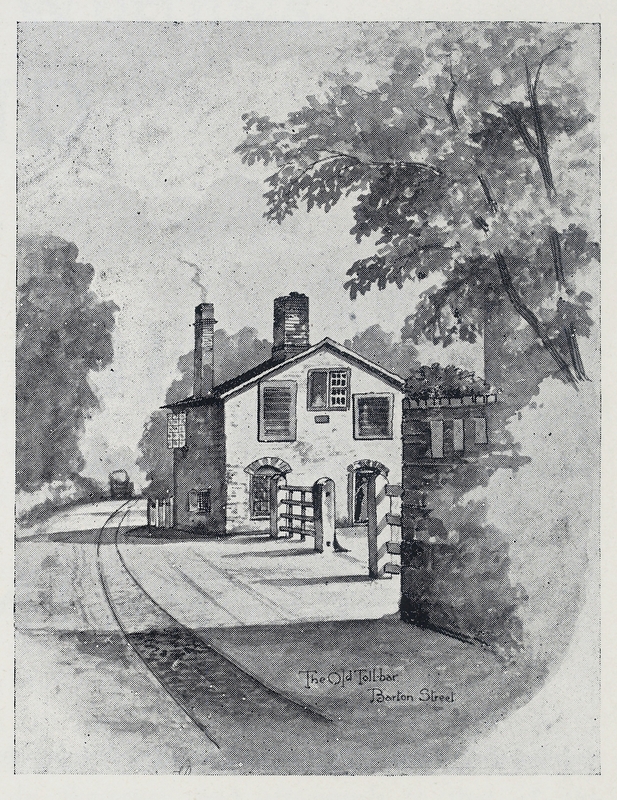 The text of the upper image reads “Old Barton Street. Tramway from Gloster (sic) to Cheltenham. The house in centre of photo stands on site of present All Saints Church”. Thus, this is now the area of Trier Way and the Anglo-Asian Cultural Centre. 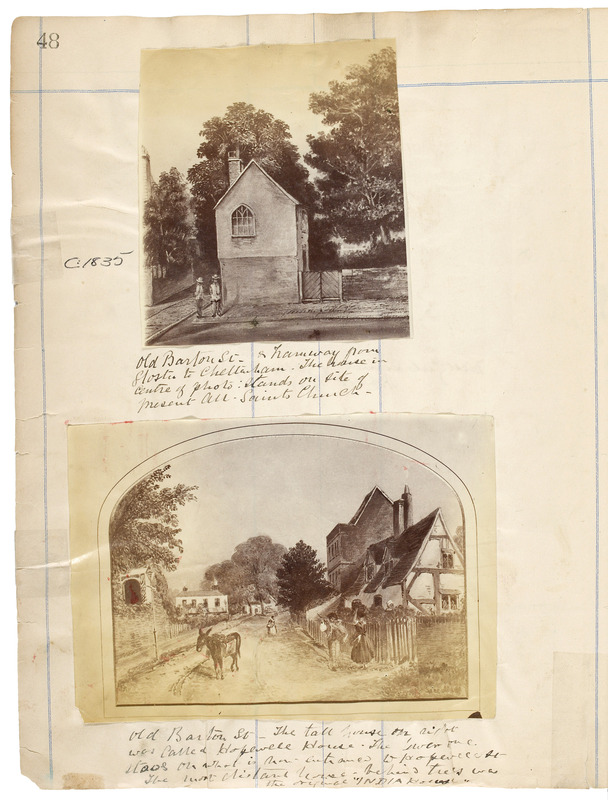 The text accompanying the second image is harder to read, but is roughly “Old Barton Street. The tall house on right was called Hopewell House. The lower one stood on what is now entrance to Hopewell St. The more distant house behind trees was the original “INDIA House”. The donkey with panniers and the maids carrying buckets and baskets in this image indicate the country atmosphere of Barton Street in this period. Look closely and you can see that the gentleman front right is carrying a dog in his arms. The third image again shows the old toll house and tramway on the corner of Barton Street, but this time in a much clearer way. The final image is of a theatre in Barton Street. This is presumably the theatre converted from an existing building in 1763. Samuel Ryley, who was the theatre manager in 1784, described it as “a melancholy, inconvenient place” in his book The Itinerant, or Memoirs of an Actor, published in 1808. You can see a larger image by clicking on either of the pictures. My 3rd Gt Grandfather John Leighton was Blacksmith at 5 Barton Street, Gloucester in 1861. 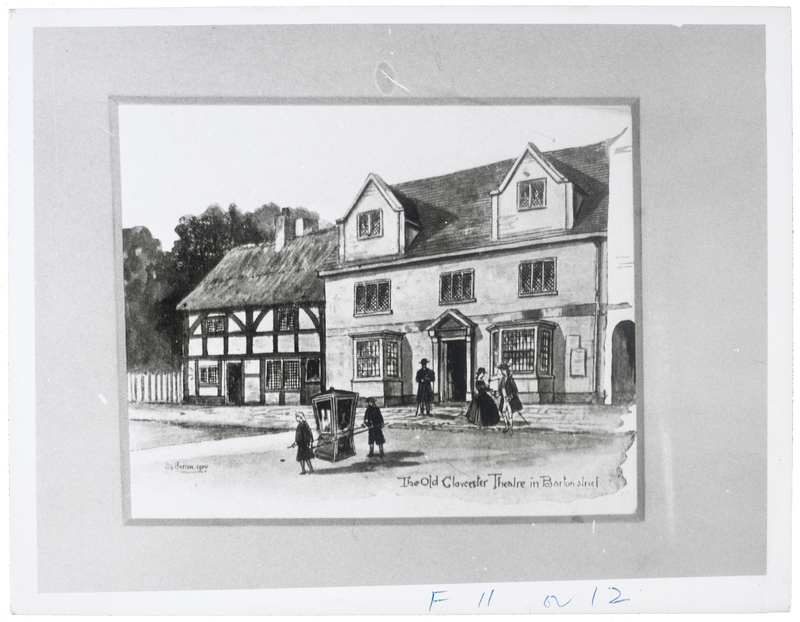 It was a joy to see the drawings of old Barton Street and also the photographs of street scenes of old Gloucester.